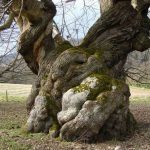 Veteran trees are a significant part of the historic, cultural and ecological heritage treasured by many generations; in the past, because of their economic and social value or as elements of picturesque or romantic landscapes and more recently as a result of our increased understanding of their considerable ecological importance. All veteran trees are a relic of a former landscape. Each tree or group of trees deserves individual consideration and study, perhaps combined with document-based research of local and national archives to enable us to understand fully, their historic context and importance. Management of veteran trees is often needed to ensure that any threat does not cause the loss of the trees and the value associated with them. Active management may not involve much work. The critical point is that the trees and their local environment are inspected at regular intervals and management carried out only if absolutely necessary.